Have you ever stood on a roof of a commercial building or near the perimeter of a building under construction, looked at the railings, and wondered, “I know the railings are keeping me safe, but how did they get there?” I mean, at some point, some worker had to be risking his or her life to put up the rails that would protect your life, right? So, let’s think this through. Sometimes rails are chosen as the method of fall protection because there is no suitable anchor point to which to tie-off (despite the fact that rails, as an engineering control, should be chosen before a personal fall arrest system - which is PPE ). This can happen on a flat roof, for example, where there’s nothing more than a few flimsy pipes around. How, then, can the railing erector be expected to protect themselves? Well, that depends on the type of railing we’re discussing. First, let’s look at parapet rail. Certain systems, such as temporary construction parapet clamp rails can be installed from an aerial lift. 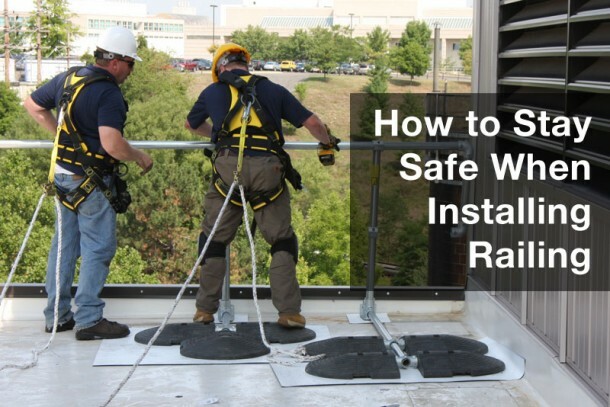 If you have a lift available to you, all you need to do is make sure your installers are trained in fall protection, properly don their harness and appropriate lanyard, and install from the basket. This means no time is spent on the roof and no time is spent unprotected, yet it’s an option that’s often overlooked in favor of installing from the rooftop. Of course, installation isn’t always that simple (and sometimes there isn’t a lift available, let alone somebody trained to operate it). Many types of rail, especially more permanent types, will require workers to be on the roof, at the very edge. How can they be protected if there aren’t any existing anchor points? Simple. They need to bring their own anchor point. There are a wide variety of mobile anchor points on the market today. From pre-fabricated horizontal lifelines, to dead weight anchors, to roofing carts, something exists to help your workers get the job done safely. Each has their pros and cons (the knowledge necessary to install and use properly, weight of the equipment, the need to penetrate the roof or not, etc. ), but each is a viable solution. The problem is that companies often fail to plan out their fall protection solutions ahead of time, leaving them in a panic if and when they realize they aren’t safe (let alone in compliance). By that point, getting safety equipment where it needs to be or, worse yet, purchasing it in the first place becomes an issue; Schedules will get delayed and budgets will get overspent. Neither of these is, of course, a valid excuse; nevertheless, they’re the excuses you’ll hear. If you know your employees will need to install rails, then begin your hazard assessment now. Figure out what type of rails you will usually be installing and determine what the safest method is to do so. Purchase the equipment you’ll need and train your personnel. Don’t get caught off-guard when the job arises with a deadline to meet. Another way to protect your employees when rails are being installed is to eliminate the hazard altogether. This is done often during steel erection. Perimeter beams will be fabricated with stanchions and horizontal lifelines in place. When the beam is lifted into place and connected, the anchor point already exists. The lifeline will be used when necessary for the duration of steel erection, as well as when the steel contractor installs the perimeter cable. Once the perimeter cable is in place, the stanchions and lifelines can be removed. With this method, nobody was left unprotected at any given time. There was a time when much of today’s fall protection technology did not exist. Unfortunately, many companies still treat their work as if it still didn’t. As long as employers realize and remember that their railing installers need protection, with the products on the market today there is no reason they should not be able to provide it.